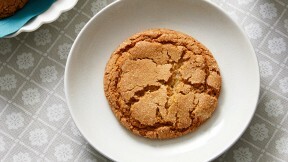 Make Martha Stewart's Australian Ginger Cookies from the Cookies of Australia & New Zealand episode of Martha Bakes. Whisk together flour, ground ginger, pepper, nutmeg, baking soda, and salt in a large bowl; set aside. In the bowl of an electric mixer fitted with the paddle attachment, cream together butter, brown and granulated sugars, and grated ginger until light and fluffy, about 2 minutes. Add eggs, one at a time, beating well after each addition. Add golden syrup and continue to beat, scraping down sides as necessary, until thoroughly combined. Mix in crystallized ginger. Reduce speed to low and add flour mixture; mix until just combined. Cover with plastic wrap and refrigerate until firm, at least 2 hours. Using a 1/4-cup ice cream scoop, drop dough onto a parchment-lined baking sheet. If dough becomes soft, refrigerate 20 minutes. Roll dough into balls between your palms, then roll in sanding sugar to coat. Place 6 balls each on two fresh parchment-lined baking sheets, spacing at least 2 inches apart. Freeze until firm, about 30 minutes. Meanwhile, preheat oven to 350 degrees. Bake, rotating halfway through, until edges are golden, 17 to 20 minutes. Let cool on sheets 5 minutes, then transfer to wire racks to cool completely. Cookies can be stored in an airtight container at room temperature up to 3 days.